Phenomenology is a useful methodology for describing and ordering experience. As such, phenomenology can be specifically applied to the first person experience of illness in order to illuminate this experience and enable health care providers to enhance their understanding of it. However, this approach has been underutilized in the philosophy of medicine as well as in medical training and practice. This paper demonstrates the usefulness of phenomenology to clinical medicine. In order to describe the experience of illness, we need a phenomenological approach that gives the body a central role and acknowledges the primacy of perception. I present such a phenomenological method and show how it could usefully illuminate the experience of illness through a set of concepts taken from Merleau-Ponty. His distinction between the biological body and the body as lived, analysis of the habitual body, and the notions of motor intentionality and intentional arc are used to capture the experience of illness. I then discuss the applications this approach could have in medicine. These include narrowing the gap between objective assessments of well-being in illness and subjective experiences which are varied and diverse; developing a more attuned dialogue between physicians and patients based on a thick understanding of illness; developing research methods that are informed by phenomenology and thus go beyond existing qualitative methods; and providing medical staff with a concrete understanding of the impact of illness on the life-world of patients. McClimans, L. 2011. Choosing a patient-reported outcome measure. 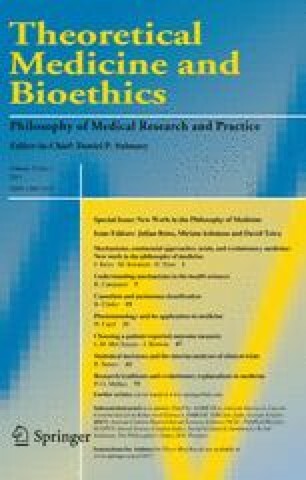 Theoretical Medicine and Bioethics 32(1). doi: 10.1007/s11017-010-9163-8.